A shrunken man kept in a birdcage, or maybe trapped there for a certain amount of time: As far as scenarios go, it’s a usual dish in my mind’s menu, but every once in a while I try to put myself in someone else’s shoes, someone that might have no idea these thoughts exist, and I bet that someone else figures the thinker of such thoughts has to be insane. But… no. After all these years exploring the Internet and every so often encountering things that seem crazy, I have to say I’m as normal as anybody ever is, at any given time. Flame wars. There are many things in my life I prefer doing in order to waste time. Provoking others to type insults so I can retort with other insults seems outlandish. Comments in news articles. There are very few people in this world whose opinions have any weight with me. Complete strangers beseeching others to leave a celebrity alone or bickering about spelling… man, it makes me tired just writing about it. OK, I’m done carrying on about that. The point is that everybody falls into weirdness when beheld through the spectacles of other people. What others might perceive as my weirdness happens to be loving the idea of a shrunken man in various situations often precipitated by me. Thinking of him in a cage, any cage, especially a birdcage, seems mundane to me, normal as normal can be, and nothing at all extraordinary. So next time you are out on the street and catch a woman eyeing you intently, it’s possible she’s pondering how well you’d look at only two inches in height. Think outside the box and imagine maybe she wants to put you in one. Perhaps she’s remembering that cage in her living room, the one with newspaper on its bottom, a little swing that dangles from the top, and a door that barely fits her hand, but ample enough to fit your body. Then she’ll forget all about you and get on with her errands because she’s normal, you see. As normal as you or me or the rest of the world. Excellent collage. I especially enjoy the adoring and amused gaze of the woman. The fact that he’s consciously displaying himself for her also makes this one tick. I agree with you about dem vore folks though. What is up with that? Thank you, trinket, and ditto. I also get a kick out of his size, and how it’s perfectly obvious that he could escape from that cage any time he wishes, since he’s too small for those bars to keep him in it, but that he behaves as he does instead was something that made me enjoy matching the elements for this collage and imagining their scenario as I did while I worked on it. Those vore people! I don’t know what’s to be said about them, really. Their shenanigans must be stopped! Yeah, I’m one of those vore people. Soft vore stuff is loverly, but the harder stuff does a weird number in my brain in that I actually find it hysterically funny. A truly beautiful collage. For me, the essence of being a shrunken man is the eye contact that occurs shortly thereafter. And what beautiful eyes they are. Glittering twin stars blinding me in the light if their gaze. Hello Small Paul, and thank you! I’m glad you like “Caged”. It was very labor intensive, but as I recall, one of the easiest images to spend endless hours and hours selecting pixels and moving and changing them, etc. Its theme was altogether helpful, and that eye contact you mention is key, and the reason I spent time figuring out how to move Mrs. Rai’s irises to obtain it. An excellent commentary! It’s an unfortunate thing that I’ve dealt with for most of my almost 46 years on this planet, this fantasy that drives me to distraction. Numerous are the times, strolling through Kirkland’s or even a local thrift store, where I see a decorative (or practical) animal cage and immediately have to still my pulse and force thoughts of myself within said contraption, staring out into the playful, amused eyes of my Giant Captress. All the while, other customers are bustling by me, wondering about this nincompoop hanging out in the middle of the aisle staring, dumbfounded, at a freakin’ birdcage. Wow… that is a POWERFUL montage and commentary You’ve written there. Thank You!! I know no one guesses what we’re thinking when we get lost in our thoughts in public, but it feels as though I might as well put my mental images on a billboard, I perceive myself so exposed. 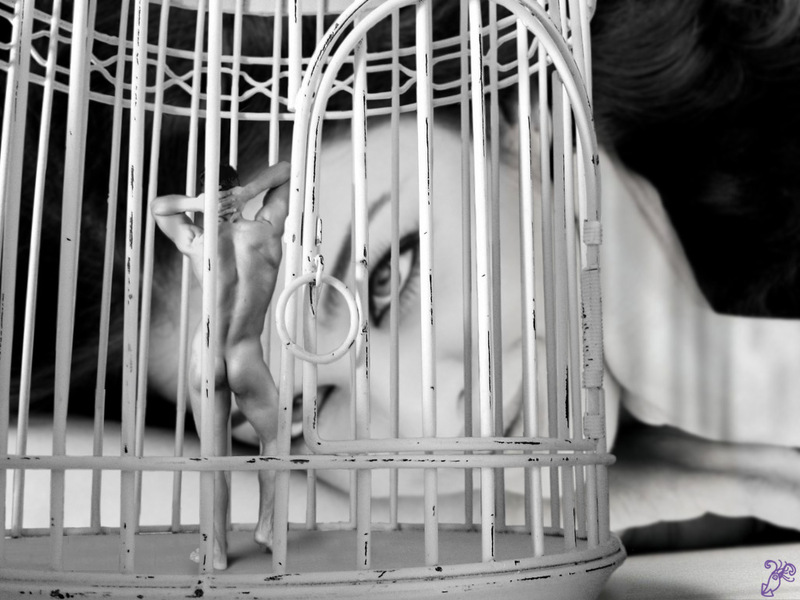 With me it happens when I see decorative (or real) birdcages. Functional cages for other pets just bring my cats to mind… probably because that’s what I use them for, and they are not very pretty. You’re welcome, and thank you, J A!